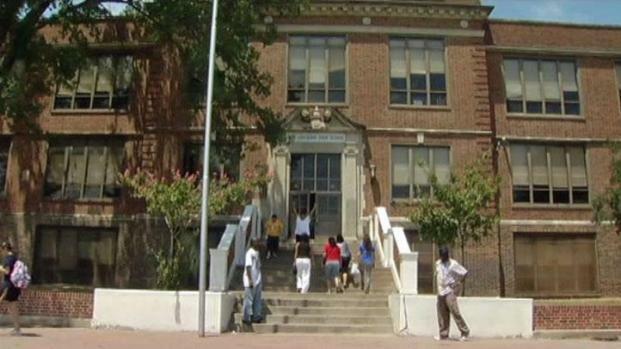 Teachers at an Oak Cliff high school are preparing their classrooms in the sweltering heat. A 40-ton chiller on an air-conditioning unit over the east wing of Adamson High School broke, leaving more than a dozen classrooms without cool air. Some teachers are wondering if their classrooms will have air-conditioning by the time the first bell rings on the first day of school. Though teachers were encouraged to do work in the cooler parts of the school building, many had no choice but to endure the heat with fans whirring and windows open to prepare their classrooms. The air conditioning unit at Adamson High School in Dallas is out and students and teachers are wondering if it will be fixed before the bell rings on the new school year. And a broken air-conditioner is nothing new to students or teachers. "This is a recurring problem every school year, it seems like," said Rena Hodea, president of Alliance-American Federation of Teachers. When Dallas Independent School District maintenance crews couldn't fix the problem, the district called the manufacturer, which is now working on the problem. The district told teachers of contingency plans. "What will happen is, if the air is out, those emergency plans will be put in place where buses will be deployed to take the kids and transport them to a facility that does have air," Hodea said. Dallas ISD spokeswoman Sandra Guerrero said the district hopes to have the air-conditioner fixed by Thursday.